DAVENPORT, Iowa -- Former presidential candidate Mitt Romney made his return to the all-important state of Iowa Friday for the first time since his 2012 defeat. This time, though, the Romney-Ryan campaign signs were replaced with those of Iowa Senate candidate Joni Ernst, who is running in a competitive Republican primary. Romney, who lost Iowa to President Barack Obama by six points in 2012, endorsed Ernst in early March and his appearance here marks one of the first – and certainly the most high profile - times he has stumped for a Republican candidate since his own unsuccessful campaign. The GOP primary here is Tuesday and the winner will face Democratic Rep. Bruce Braley in the fall -- it is the first open seat election for Senate in the state in decades. Recent polls show Ernst to be the frontrunner ahead of businessman Mark Jacobs. “Bruce Braley’s way, the Washington way, it is not working. It is not working. But let me tell you what, our way, the Iowa way is working,” Ernst told supporters at a rally in Cedar Rapids Friday morning. If Ernst – who serves as a Lieutenant Colonel in the Iowa Army National Guard in addition to serving in the state senate – were to win in November, she would become the first women ever to serve in Congress from the Hawkeye State. Romney's endorsement came before Ernst garnered national attention when her campaign ad about castrating hogs went viral. “She didn’t just sit home needlepointing; she was actually doing some work on the farm. Squealing work on the farm,” Romney pointed out, referencing the ad. Romney isn’t the only high-profile endorsement Ernst has received. Former vice presidential nominee Sarah Palin has also campaigned with the state senator. Romney and Palin endorsing the same candidate may seem like an unlikely pairing but the former Massachusetts governor said they all share the same end goal. “We have different approaches but we are all battling against the establishment of Barack Obama and the Democratic Party. Sarah Palin and I think line up on most issues, if not all issues. We have different approaches on how to get the job done in Washington. I am not surprised at all that Sarah Palin would see Joni Ernst and say we stand for the same things, we are going to fight for the same things and Joni Ernst is the right person to become the U.S. Senator,” Romney told reporters. The endorsement of Ernst is just one example of Romney lending a hand this cycle to a variety of establishment candidates throughout the country running in competitive GOP primaries. His picks have all been successful thus far. Despite finishing in second place in both the 2008 and 2012 Republican caucuses, Romney has made a great deal of connections – including financially – in Iowa over the past eight years. He even greeted many supporters in the audience at both events today by name. These ties may help push Ernst over the edge in Tuesday primary. 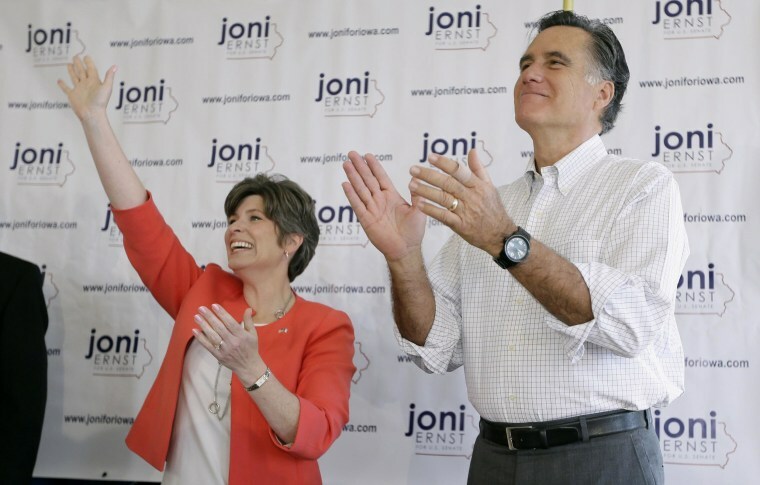 “I think here in Iowa we are likely to see a very strong turnout for Joni and I think she is going to win,” Romney said.